This PDF 1.4 document has been generated by Writer / LibreOffice 4.2, and has been sent on pdf-archive.com on 26/02/2016 at 23:13, from IP address 37.228.x.x. The current document download page has been viewed 330 times. The Unix utilities head and tail output the first and last parts of files respectively. Your assignment is to implement your own version of one of these in C.
You will submit your code to both online codechecker and file submission. You will be randomly assigned your variation when you first click on Assignment 1 codechecker. either even or odd line listing. your name, student number and email address. Print the first | last 10 lines of FILE to standard output . If no FILE read standard input. -V Output version info: Your name, email , student number , your variant. -h display and exit ( something like this ) . -e print even lines . -o print odd lines . first|last 40 lines). Number the first line of the file as 1 when calculating odd and even. 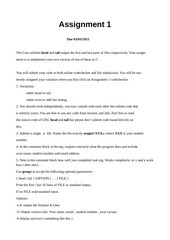 • Submit code to both Codechecker and file submission before deadline. -Ensure you press “Submit all and finish” before the deadline. • Name your file as specified. • Include a note on your progress. • Make good use of lecture notes and labs. This file has been shared by a user of PDF Archive. Document ID: 00343658.